Gary Neville's Valencia suffered a humiliating defeat as they were crushed by Barcelona in the Copa del Rey semi-final first leg at the Nou Camp. Luis Suarez scored four goals, while Lionel Messi also helped himself to a hat-trick and Neymar missed a penalty. Valencia's cause was not helped when defender Shkodran Mustafi was sent off for fouling Messi in the first half. Neville is also without a league win in eight attempts since taking over the club in December. Former England and Manchester United full-back Neville was returning to the scene of one of his greatest triumphs. As a 24-year-old he was part of the United team who won the Champions League with a spectacular late comeback against Bayern Munich in the 1999 final at the Nou Camp. This time there was to be no miraculous turnaround. These are testing times for the 40-year-old who was already under pressure before the game against the European champions. The Copa del Rey had hitherto offered eight-time Premier League winner Neville some solace after five draws and three defeats in La Liga. All four of his wins from 14 games in charge in Spain have come in this competition - yet this was nothing short of embarrassing. Valencia were shocking from start to finish and there was only going to be one outcome once Barca went 2-0 up in 12 minutes. Suarez broke the deadlock after racing on to Neymar's pass before the former Liverpool player doubled the lead, curling home from 10 yards after a breathless move. Messi completed a delightful move to make it 3-0 before a frantic end to the half. The Argentina star was denied by the bar and Neymar hit the post from the penalty spot - after being fouled by Mustafi, who was sent off. It went from bad to worse in the second half, Suarez's back-heel allowing Messi to pick his spot inside the area and take his career tally to 500 goals. Terrible defending by Valencia allowed Messi to complete his hat-trick and make it 5-0 after winning the ball back before firing past the keeper, who should have saved. Suarez's hat-trick goal was a close-range header and there was still time for the Uruguay international to get his fourth - and Barca's seventh - as he found the net via the near post. The return leg takes place at the Mestalla next Wednesday. As bad as Valencia were, Barcelona produced an exhibition of exquisite football, a masterclass in finishing. Luis Enrique's name was chanted by the home fans who are starting to believe their team can end the season with five trophies. Having already sealed the Uefa Super Club and Fifa Club World Cup, they are three points clear at the top of La Liga with one game in hand. They also face Arsenal in the last 16 of the Champions League. Barca are in terrific form at the right stage of the season, sweeping aside all before them. They look an unstoppable force. 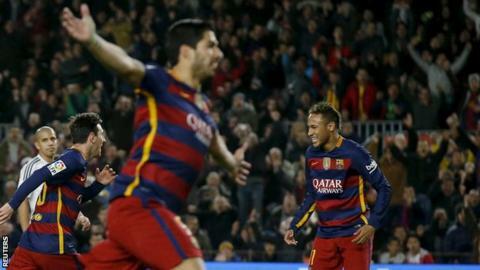 Barcelona's ninth win in a row took the team's unbeaten streak in all competitions to 27 games. Barca have not lost since a 2-1 defeat at Sevilla in October in La Liga. They have more than 100 goals this season. Valencia are without a win in 11 La Liga games. It is perhaps just as well Valencia are not at home on Sunday - Neville's team travel to face Real Betis in La Liga on Sunday. Barcelona are away at bottom club Levante on the same day.